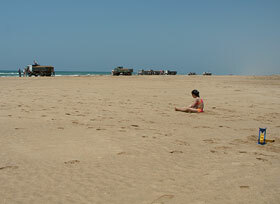 Trucks on the beach in Morocco. Beach sand miners in Morocco remove the beach, one shovel full at a time. 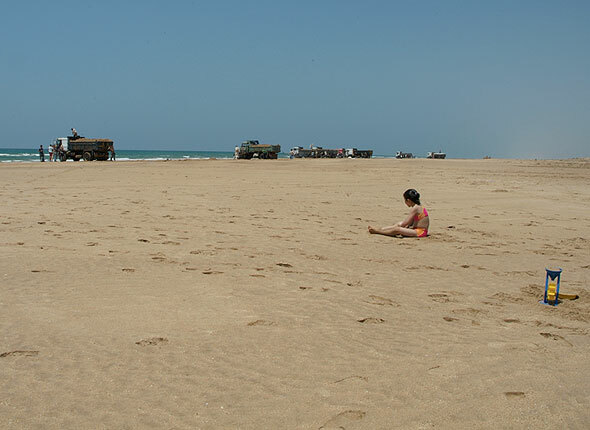 Beach sand mining near Larache, Morocco. The world’s beaches are being mined for sand for a variety of uses (aggregate in concrete, fill, beach renourishment). The practice is often very destructive and poorly managed (or unmanaged). This is a global phenomenon (Morocco, Caribbean Islands, India, South Africa and more). This theft of beach and dune sand is a direct cause of erosion along many shorelines. It is very damaging to the beach fauna and flora, ruinous to beach aesthetics, and frequently causes environmental damage to other coastal ecosystems associated with the beach such as wetlands. Another major impact of beach sand mining is the loss of protection from storms surges associated with tropical cyclones and tsunamis. Some communities affected by the 2004 tsunami in the Indian Ocean had higher storm surges probably due to beach sand mining resulting in fatalities. Sometimes it is difficult to tell that a beach has been mined. Sand extraction becomes difficult to recognize as the beach readjusts to a new profile after a few storms. But historic accounts of beaches in the Caribbean often reveal that beaches have been narrowed considerably. Mining is particularly senseless in a time of rising sea level when sand is sorely needed as a storm energy buffer. After a trip to the beach, you’re likely to return with sand in your hair, between your toes, underneath your fingernails. It might be difficult to believe that the world is running out of the stuff, but it is. A study from the National Marine Fisheries Service says a few more endangered sturgeon and sea turtles have been killed as a result of the dredging in the Savannah River. Miami is out of sand. Last year, Miami-Dade County depleted its offshore sand reserves, meaning miles of beaches that shrink from erosion must be replenished with sand from outside South Florida. Sand is a natural resource that is more and more exploited. Worldwide, beaches are mined for sand. 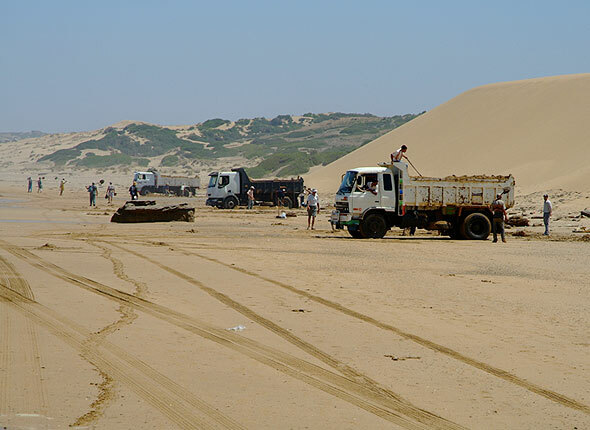 As many other countries in the world, African States have legislated to better protect their coastal environment, but this did not put an end to illegal beach sand mining and its detrimental effects on the ecosystems. 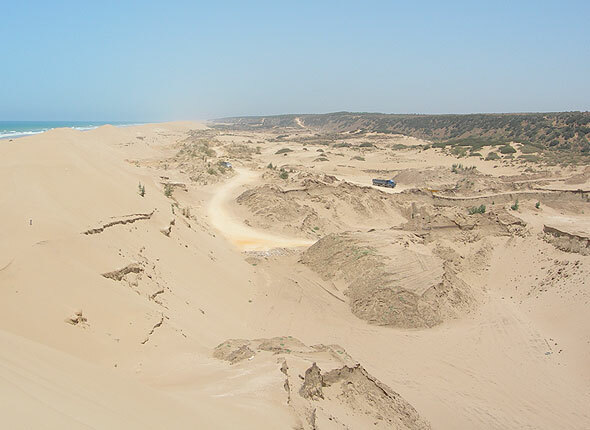 Sand scarcity is one of the main cause of implementation deplays in the construction industry in Algeria. The severity of the sand depletion is such that prices have gone up tenfold during this latest construction boom. A symposium taking place at Dutch Design Week later this month will discuss the rapid depletion of the world’s sand reserves, which could leave supplies of the high-quality sand used in the glass industry exhausted within 20 years. Later this month, Dutch Design Week will host a symposium entitled “The Abundance and Scarcity of Sand.” Notable speakers include geologist and author Michael Welland, as well as Denis Delestrac, whose 2013 documentary, Sand Wars, showcased the lengths that contractors and smugglers alike will go to hoard and sell a commodity second only to freshwater, in terms of consumption. A french mayor discovered that sand from the town’s local beach, was for sale on the internet. Maybe rather inconspicuous at first glance, this occurence instead reveals far deeper tensions related to the exploitation of this finite ressources. The ravenous hunger for sand worldwide was spotlighted in the 2013 documentary “Sand Wars” by French filmmaker Denis Delestrac, which warned that illegal sand mining could make beaches a thing of the past by the end of the 21st century. Because of the difficulty in regulating their consumption, common-pool resources are prone to tragedies of the commons as people may selfishly extract them without considering long-term consequences, eventually leading to overexploitation or degradation. Even when sand mining is regulated, it is often subject to rampant illegal extraction and trade. When powerful storms strike, like Typhoon Hato in southern China or Hurricane Harvey in Texas, the surging water scatters tons of sand – an essential ingredient required for the rebuilding soon to follow. Such storms add to growing global demand for sand with poor consequences for the economy and environment. Famed for its pristine beaches, the Mediterranean island of Sardinia has hit back at holidaymakers who have been pinching its sand. Communities are pitted against sand harvesters, powerful cartels and one another as demand for sand in Kenya grows. Investigation launched into allegations that sand in Gran Canaria resort was sourced from Africa’s last colony, in breach of international law. Summer seems incomplete without a day at the beach with your toes in the sand. We know you’re there to relax and not think about much, but here are a few facts about sand.